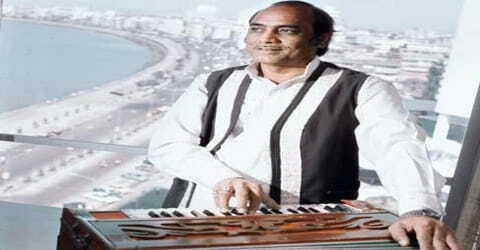 Mehdi Hassan – Pakistani ghazal singer and playback singer. 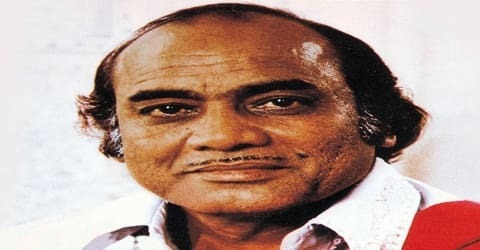 A Pakistani singer used his haunting baritone to bring ghazal singing to a wide audience and recorded thousands of songs written in Urdu verse, Mehdi Hassan was born on 18 July 1927 in a village called Luna in Jodhpur district in British India into a family of traditional musicians. One of the greatest and most influential figures in the history of ghazal singing, he is famously known as the “King of Ghazal” or the “Shahanshah-e-Ghazal”. 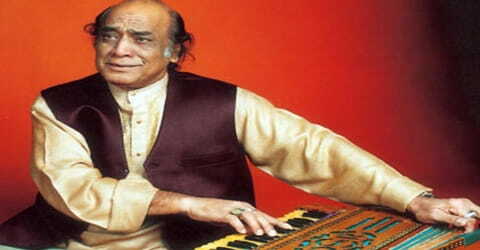 Known for his “haunting” baritone voice, Mehdi Hassan is credited with bringing ghazal singing to a worldwide audience. He is unique for his melodic patterns and maintaining the integrity of the ragas in an innovative manner and keeping in mind the majesty of Hindustani Music going back for thousands of years. He was aware of his responsibility in keeping the raga-based ghazal genre alive in modern times. Born into a musical family, Mehdi Hassan was naturally inclined towards the art from a young age. He claimed to belong to the 16th generation of hereditary musicians hailing from the Kalawant clan of musicians. As a young boy he received his primary training in music from his father who himself was a prominent traditional Dhrupad singer; his uncle was also an important early influence. He started performing at quite an early age and seemed to be headed for a successful musical career when the partition of India happened. Joining several other Muslims, Hassan and his family migrated to Pakistan and suffered severe financial hardships over the next few years. Mehdi Hassan struggled to establish himself as a singer and made ends meet by working odd jobs. His hard work eventually paid off and he received the opportunity to sing on Radio Pakistan which gained him considerable fame. He went on to establish himself as one of the greatest ever ghazal singers and received much recognition for his contribution to classical music. Mehdi Hassan, by name of Mehdi Hasan Khan (Urdu: مہدی حسَن خان ‎), was born on 18 July 1927 in a village called Luna, Rajasthan, in India. He hailed from a family with a rich musical legacy he claimed to be the 16th generation of hereditary musicians hailing from the Kalawant clan of musicians. His ancestors were “Darbari Ustads”, seasoned performers in the courts of several Maharajahs of Indore, Patna, Chhatarpur and Mysore. Mehdi Hassan never had a formal education. His education was solely in the field of classical music that he had been studying since the age of eight. 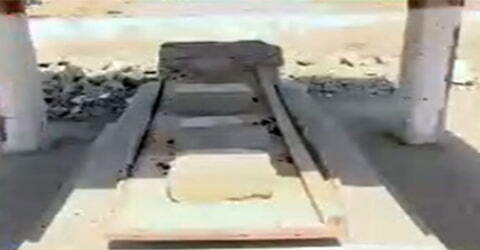 He was trained under his father Ustad Azeem Khan and uncle Ustad Ismail Khan. He hails from the family that produces fifteen generations of musicians making him the “solva pusht” (sixteenth generation) of artists, with an ancestry that boasts of “Darbari Ustads” who were seasoned performers in the courts of several Maharajahs of Indore, Patna, Chhatarpur, and Mysore. He did not receive any formal education other than his music training. Mehdi Hassan started performing at a young age and reportedly gave his first concert with his elder brother in Fazilka Bungla. In 1947, India became independent and its partition took place, creating a new, Muslim-majority country, Pakistan. The 20-year-old Hassan and his family migrated to Pakistan, carrying little with them by way of material goods. They suffered severe financial hardships in their new country. Mehdi initially started working in Ahmadpur East, in a bicycle shop Mughal Cycle House. He later became a car and diesel tractor mechanic. Despite the financial hardships, he kept up the routine of his singing practice on a daily basis. Mehdi Hassan was married twice. He had 14 children (9 Sons) & (5 Daughters). Some of his sons inherited the family knowledge of music and followed the footsteps of Ustad Mehdi Hassan and each son made music as their career. Mehdi Hassan produced his first public performance at the age of eight at the behest of the Maharaja of Baroda. Since then he has had nearly 25,000 records to his credit and has rendered nearly all forms of vocalism including classical, thumri, film music and of course the ghazal that he is most widely reputed for. When his family moved to Pakistan in 1947, Hassan continued to train while he worked as a mechanic to support the household. Eventually, he became a car and diesel tractor mechanic. His daily life was a struggle, yet he never gave up on practicing his art and was still determined to make it big as a singer. Mehdi Hassan received the opportunity to sing classical vocal for Radio Karachi in 1952. This gave him an opportunity to reach to a wide audience and he soon became popular as a ghazal singer with his deep, sonorous voice. He proved his mettle as a classical singer by rendering challenging raga-based compositions and endeared himself to the listeners. During this period he created some memorable ghazals like ‘Ranjish hi sahi’, ‘Baat karni mujhe mushkil’, ‘Ghazab kiya tere wade pe’ and ‘Gulon mein rang bhare’. By the mid-1950s his stature as a ghazal singer was rising. In 1955 launched himself into the musical rendition of the ghazal, an art which has become his main forte. His chief characteristic is the relaxed and assured style of his presentations. In 1957, Mehdi Hassan was again given the opportunity to sing on Radio Pakistan, primarily as a thumri singer, which earned him recognition within the musical fraternity. He had a passion for Urdu poetry, and therefore, he began to experiment by singing ghazals on a part-time basis. He cites radio officers Z.A. Bukhari and Rafiq Anwar as additional influences in his progression as a ghazal singer. His first film song was “Nazar Milte Hi Dil Ki Bat Ka Charcha Na Ho Jaye” film Shikar in 1956. This song was written by poet Yazdani Jalandhari and its music was composed by Asghar Ali M. Husain. Mehdi Hassan earned much acclaim as a ghazal singer and soon ventured into films as well. In 1962, he sang ‘Jis ne mere dil ko dard diya’ for the film ‘Susral’. He got a big break in 1964 when he sang ‘Gulon mein rang bharay, baad-e-naubahar chale’ for the film ‘Farangi’. This ghazal proved to be a major hit and cemented his career as a much sought after ghazal singer in Pakistani cinema. 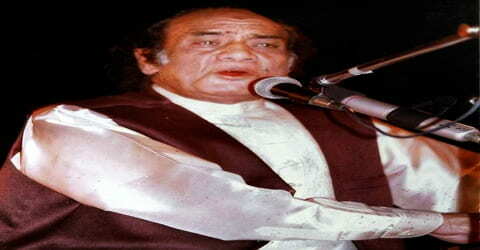 Even the original ghazal poet Faiz Ahmed Faiz stopped reciting it in his ‘mushairas’ (poetry reciting events) and, instead, recommended that the audience ask Mehdi Hassan to sing it for them because the poet jokingly used to say that the ghazal belonged to Mehdi Hassan after its popularity. Mehdi Hassan pursued an early interest in Urdu poetry and composed soulful songs that drew from the works of contemporary poets, including Faiz Ahmad Faiz. Over the following 30 years, Hassan scored dozens of hits, such as “Patta patta, boota boota” and “Kab ke Bichhare,” which transcended cultural boundaries and captivated adoring fans in both India and Pakistan. After his debut as a playback singer in the Pakistani film Kunwari Bewa (1956), he also provided acclaimed soundtracks for nearly 300 movies. He also received considerable recognition for his contributions to classical music. His deep husky voice respondent with pathos is one of the most moving experiences for music lovers. He has tremendous control over all the technical ragas which he renders in his ghazals with incomparable dexterity. His ever-popular ghazals include among others “Ranjish hi Sahi”. “Baat karni mujhe mushkil”, “Ghazab kiya tere waade pe” and “gulon mein rang bhare”. He has won the respect of all his fans and contemporaries alike. Jagjit Singh, in his “Ghazal ka Safar” candidly declares “Hamare is safar mein sab se behtreen fankar wohi (Mehdibhai) hain”. Mehdi Hassan continues to enthrall his fans with his magic and his concerts are always eagerly awaited by music lovers. 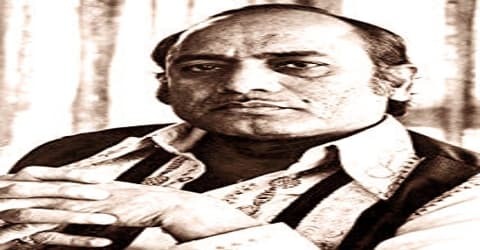 Following a severe illness in the late 1980s, Mehdi Hassan stepped down from playback singing. Later due to the severity of his illness, he completely departed from music. Mehdi Hassan was duly honored by the Government of Pakistan with several awards including Pride of Performance, Tamgha-e-Imtiaz, Hilal-e-Imtiaz, and Nishan-e-Imtiaz. The Government of Nepal decorated him with Gorkha Dakshina Bahu in 1983 and the Government of India bestowed upon him the K. L. Saigal Sangeet Shahenshah Award. Mehdi Hassan was also the recipient of several Nigar Awards, the official awards of the Pakistani film industry to honor the show business personalities of Pakistan. Mehdi Hassan had been suffering from a serious lung condition for a few years before his death. He died at around noon on 13 June 2012 at Aga Khan University Hospital, Karachi after suffering a 12-year-long tenure of lung, chest and urinary tract diseases. Mehdi Hassan was famously known as the “King of Ghazal” or the “Shahanshah-e-Ghazal” and is considered next only to Begum Akhtar in the world of Ghazal Gayeki. Some of his most famous ghazals are ‘Ranjish hi Sahi’, ‘Baat karni mujhe mushkil’, ‘Ghazab kiya tere waade pe’ and ’Gulon mein rang bhare’. In 1977, Lata Mangeshkar was so moved by his dulcet vocals during a New Delhi concert that she’s reported to have said, “Aisa lagta hai ke unke gale mein bhagwan boltein hain,” (It feels like God is singing through his voice). In October 2010, HMV Label released “Sarhadein” in which probably the first and last duet song Tera Milana featuring Mehdi Hassan and Lata Mangeshkar was released. This song was composed by Mehdi Hassan himself, written by Farhat Shahzad. Mehdi Hassan recorded it in Pakistan in 2009, and Lata Mangeshkar later heard the track and recorded her part in India in 2010, and the song was later mixed together for a duet. The same duet, “Tera Milna,” was also sung by Mehdi Hassan and Noor Jehan. 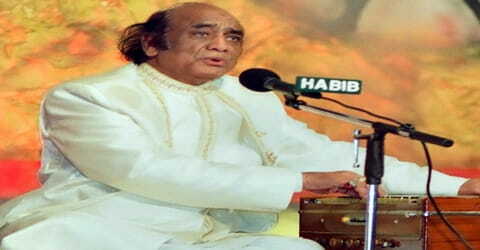 Mehdi Hassan is regarded as one of the best singers in the sub-continent. On 18 July 2018, the day of his 91st birthday, Google featured Mehdi Hassan on its homepage doodle.